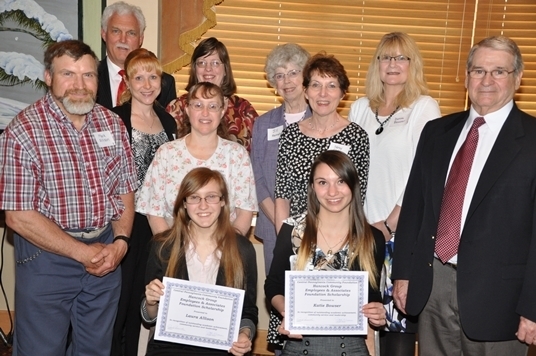 The Hancock Group Employees and Associates Foundation awarded two Scholarships at the Annual Central Pennsylvania Community Foundation luncheon on Thursday, May 8, 2014. The awards luncheon was held at The Casino, Lakemont Park. Congratulations to the 2014 scholarships recipients: Laura Allison of Williamsburg High School and Katie Bowser of Tyrone Area High School! The Hancock Group, Inc. was the first group of employees to start a charitable Foundation with the Central Pennsylvania Community Foundation. Since the inception of the Foundation on November 11, 2003, a total of 21 scholarships have been awarded to high school students bound for college. Over $30,000 has been distributed for scholarships, worthwhile projects to non-profit organizations, and memorials for clients and friends who have passed away. Contributions to the Foundation are made by employees and associates through fundraising efforts and payroll deductions. · Kathleen VanKirk, Bellwood-Antis High School. To learn more about our scholarship program, contact The Hancock Group at 814-944-8849.